?wiat cyfrowej muzyki bardzo si? zmieni? od narodzin Amaroka cztery i pól roku temu. Amarok 1 mia? reputacje innowacyjno?ci, ale rozwijanie go stawa?o si? coraz trudniejsze, w miar? jego dorastania, cz?sto w kierunkach o których nigdy by?my nie pomy?leli. KDE 4 wnosi wiele nowych technologii i modeli wzorów, zdecydowali?my wiec wykorzysta? ta mo?liwo? ?, aby ulepszy? oryginalny wygl?d Amaroka. My?leli?my, o tym jak najlepiej zaprojektowa? program, które pozwoli nam na zostanie na kraw?dzi zarz?dzania cyfrowa muzyka. Szukali?my równie? rzeczy, które by go wyró?nia?y na coraz bardziej przesyconym rynku odtwarzaczy muzyki. Aby to osi?gn? ?, wzi?li?my najlepsze pomys?y z serii 1.x oraz g?ówkowali?my co jeszcze mog?oby pomoc naszym u?ytkownikom "odkry? swoja muzyk? na nowo". Nast?pnie zacz?li?my tworzy?. Now, after two years of development, we are proud to announce that Amarok 2 has arrived. This arrival is just the beginning. The user interface has been redesigned to make context information like lyrics and albums from the same artist more accessible and allow you to decide which information you want to see by adding applets to the Context View in the middle. The new Biased Playlists offer a way to let Amarok take care of your playlist in an intelligent way similar to Dynamic Playlists in previous versions. A new service framework allows for a tight integration of online services like Jamendo, Magnatune and Ampache. New services can easily be added via GetHotNewStuff in Amarok or from kde-apps.org. More applets and scripts are being worked on and users are welcome to contribute more to make Amarok suit their needs. 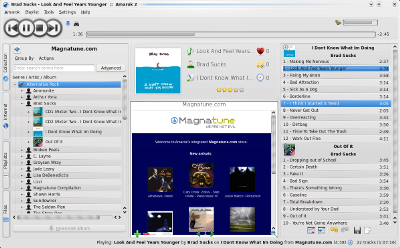 The migration from the KDE 3 to KDE 4 framework allows us to make use of technologies like Plasma, Phonon and Solid which make Amarok easier to use and maintain and ready for the future of music on your computer and on the internet. These are only some of the great new features of Amarok 2. Give it a try! It is important to note that Amarok 2.0 is a beginning, not an end. Because of the major changes required, not all features from the 1.4 are in Amarok 2. Many of these missing features, like queueing and filtering in the playlist, will return within a few releases. 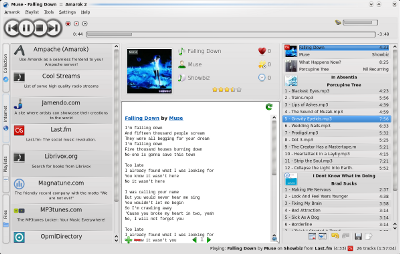 Other features, such as visualizations and support for portable media players, require improvements in the underlying KDE infrastructure. They will return as KDE4's support improves. Some features, such as the player window or support for databases other than MySQL, have been removed because either they posed insurmountable programming problems, or they didn't fit our design decisions about how to distinguish Amarok in a saturated market of music players. 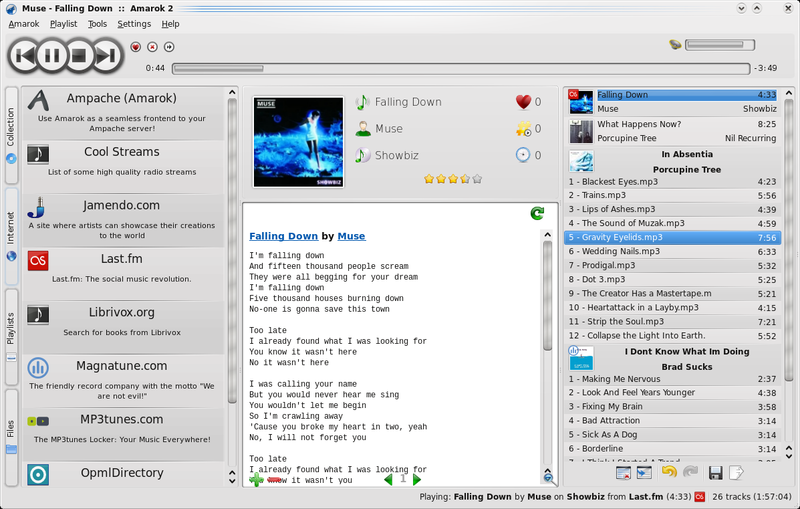 Amarok 2.0 is now available for all major Linux distributions. KDE4 is still under heavy development especially on Windows and Mac OS X, and Amarok 2 is available as a "Beta" version on those platforms. In the coming months, we expect to regularly release a series of bugfix versions in the 2.0 series. Work on features, both old and new, has also continued. So while Amarok 2 has already been a long journey for the Amarok team, for you, the users, it is just beginning! Amarok's journey has just begun and we are excited to have you join us for this event. Change and improvement would not have been possible without the help of everyone who contributed to this ambitious project in the form of code, promotion, documentation, donations, and a lot more. To all of you all we say: Thank You! Please consider contributing to our fundraiser, reading the Amarok 2 FAQ and of course don't forget to celebrate with us!